Društvo Universe in Šaleški Študentski Klub v okviru festivala Dnevi Mladih in Kulture - DMK že tretje leto ponosno predstavljata psihadelični open air dogodek Theater Of Science. Lansko leto smo na idilični lokaciji v Letnem kinu teptali pesek z Fungus Funkom, letos pa se vračamo k koreninam in temačnim organskim zvokom v družbi Hypogea. Universe crew in asocciation with Šaleški študentski klub proudly presents their third open-air event Theater of Science as a part of DMK festival. Last year we have danced wildly through the night with Fungus Funk, but this year we are returning to the roots and dark organic sounds with Hypogeo. 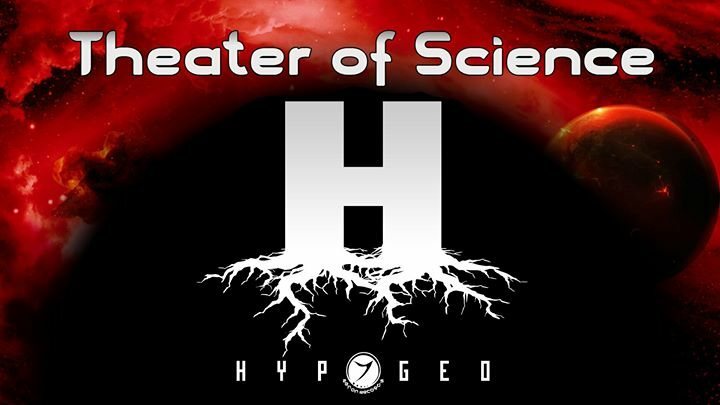 HypoGeo is "Anything that originates, grows and evolves beneath the earth". It takes shades through the producer's musical background: orchestrated by extreme metal, industrial & EBM, New Wave, Noise, techno, IDM & dark ambient. May 2012 marked the inception of HypoGeo's introduction to the wider world of music. The first full-length album "Tree of Lies" was released on Zenon records - the infamous Australian psychedelic label. The album was a huge success for the particularly aggressive and heavy sound, building the bridge between the deepest of psychedelic trance textures, some call it "forest" and the ultimate “Zenonesque” sound. Currently, HypoGeo is working on the long awaited 2nd studio album; an epitome of creativity, abstract sonic landscapes, and undeniably intricate composit. Willson is Psytrance DJ from Ljubljana Slovenia. He fell in love with the psytrance scene at the first S.U.N. Festival. With a great desire to discover the modern psy culture, he soon began to play and plays at private parties and parties all over Slovenia and shared stages with names such as Antispin, Parasect, Fobi, Quadrant, Shamaniak etc. After a few years he started to make his own parties , focusing on organizing outdoor events under the name QuadLogos Psychedelic. With great inspiration to the true Psychedelic he carefully chooses his sets according to indoor or outdoor parties and tries to never repeat. Ranging from 136 to 160. Samo Jurman a.k.a. Sinonimus is a DJ from Slovenia. He has been interested in all types of music since an early age. Despite his passion for different rhytms and different styles, his heart belongs to dark, full on, forest psytrance. In 2012 he started to produce his own psychedelic music. Hard, throbbing bass and layered psychedelic melodies are typical in his work, which takes you to a promised land of dark psychedelic rhyhtms. ceiling and stage decorations and custom made ultraviolet LED light systems. Chromophobia believes in the colors and the smiles! In the beginning (be ni gi ni ng) there was chaos. From the murk of the abyss, nothingness has yawned creating a sound, mechanical oscillation of the matter and from its resonant frequency originated the Sun. Beams of light have been spilled through the universe, mountains floated on air, beasts have spoken backwards, and the gods have fallen on vertex. Doors of the horizon were opened. Clouds hid the sky, the stars fell to the earth. Constellations were shaken, the underground silenced. Soundsystem was born. Man knew it was good. Saso Mange was his name and it quickly became a synonim for „have it all“ and „three hundred miracles“. In reality, it is a team comprised of time bandits, devoted technicians, great philosophers and combiners addicted to realisation of quality sound made for good fun of modern pilgrims-in the clubs, mountains, woods and meadows, funerals, weddings and birthdays. In the words of the ancients, Samo Tvrdo!